Click Here to Register for 2019 Now! Due to the weather conditions causing Sights & Sounds to close Friday, we will be starting packet pick-ups on Saturday early at 7:30 a.m. by the main entrance. 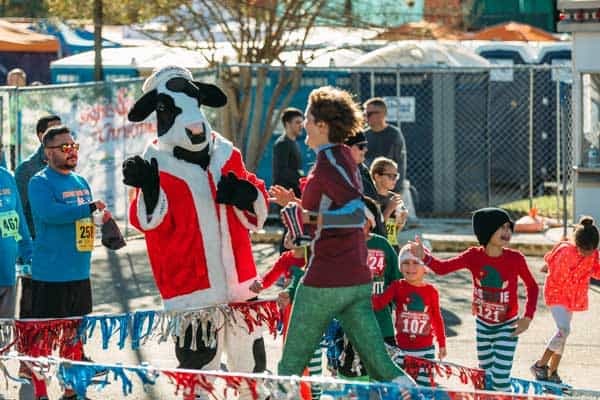 The Sights & Sounds of Christmas Jingle Bell Run 5K will race through San Marcos’ beautiful downtown and Historic District on Saturday, December 8. Runners and walkers of all ages and fitness levels are welcome to participate! Everyone will be given jingle bells to wear during the race and holiday attire is encouraged. 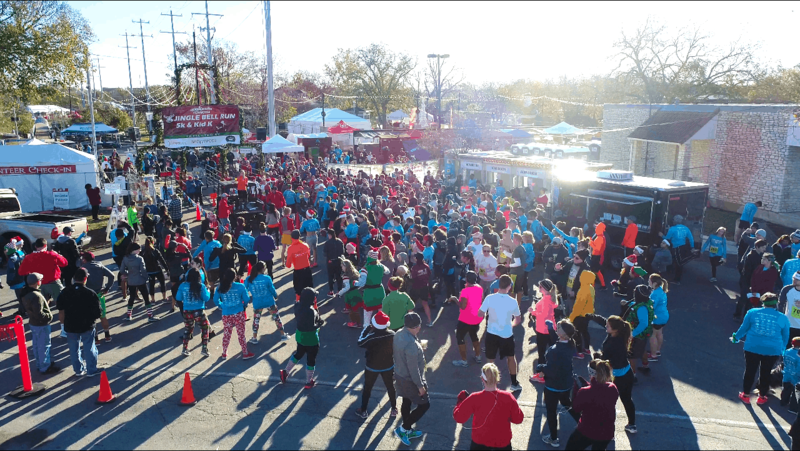 The race will begin and finish at San Marcos Plaza Park at Hutchison & CM Allen and will feature Christmas music throughout the course. Participants who are registered by December 3 will receive a t-shirt; anyone registered after is not guaranteed a current year race shirt or size. The cost is $30 now through December 7 and will be $40 the day of the race. Inside Sights & Sounds 6-11PM each night during the festival at the 5K tent located at the main gates at CM Allen & Hutchison Streets. *If you are not attending the festival but want to pick up your packet early, you must go to volunteer check inside the chamber of commerce office during festival hours. Click to the see benefits of picking up runner bag early! Due to road construction on CM Allen we will not have a drive-thru packet pick up this year. Packets are available each night of the festival at the 5K tent, as well as on race morning. 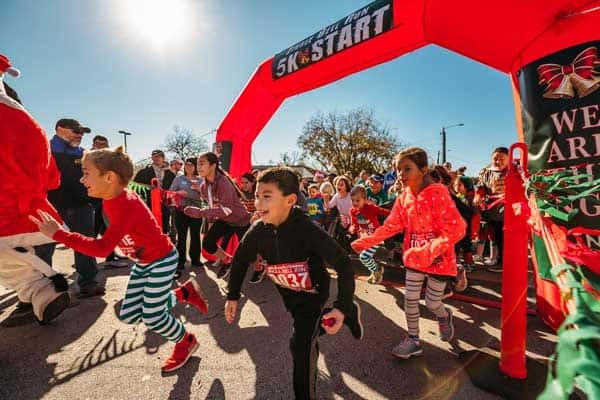 The awards ceremony will be held at San Marcos Plaza Park following the Kids 1K. Top finishers in each category will be recognized at this time and door prizes will be given out. Contest for runners dressed in holiday spirit!! Most festive runner will receive a door prize! Pick up your runner bag prior to race day at the festival for a chance to win $550 in cash and prizes! If runner bag is not picked up by the start of the race on race day, it will be forfeited. Online registration for 2019 is now available. Save money by registering early! Common Questions with the Answer Being Yes! Common Questions with the Answer Being No. Runners may change the basic registration details, verify registration, transfer a registration to another runner, and resend a confirmation email with no cost. All basic edits must be completed by DEC 4th. A few examples of basic edits include: email, address, phone number, birth date, gender, shirt size, etc. You can take care of BASIC REGISTRATION EDITS by CLICKING HERE, and choosing the option that pertains to your situation. DEC 4th you will not be able to make T-shirt size changes or transfer registration to another runner without contacting the race director. May I run with a stroller and not have to register the children in the stroller? May I run with a dog on a leash? Strollers and dogs please remain towards the back of the start group for safety. Is there a place for me to store my coat, bag, keys, etc.? –Runner’s closet near registration however, we are not responsible for lost, left behind, or stolen items. Will you have vendors providing b-fest sandwiches, water, and hot chocolate to runners? Is the race on rain or shine? Can I pick up my packet in race tent 6-11pm of festival each night? If I cannot make the race may I pick up my packet Dec 3rd in the race tent that night? Can I use the free entry any night of the festival once I pick up my packet? Is it okay to dress in holiday attire? Will I receive a Technical T-shirt, chipped bib, free entry into festival, safety pins, and jingle bells in my runner packet? Is there holiday music on the race course? May I walk this race if I am not a runner? –We have a huge group of walkers. May I park at the San Marcos Activity Center, Library, and downtown parking spaces race morning? May my friends, mother, cousin, spouse, come down and cheer me on? If my questions are not answered may I contact the Race Director? My dog is well behaved may he run off a leash? May I leave my kids at registration while I run/walk? May I run with my bib anywhere other than on the front of my shirt? May I have a refund if I cancel my registration before the race for any reason? Is this a closed course? -However, we have over 20 SMPD, several Rangers, and loads of San Marcos Runners Club, and community volunteers to guide you. Are there refunds for cancellation due to severe weather or an act of God?